Facebook’s big F8 conference just kicked off a short while ago, but the biggest news from the show is already behind us as far as I’m concerned. That’s right, the hot new Oculus Go VR Headset is now available! 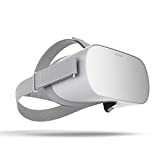 The days of having to buy an expensive Oculus VR headset and an even more expensive gaming PC in order to enjoy the Oculus experience are long gone thanks to the new Oculus Go. It’s a standalone VR headset that only costs $199, and yet it offers a VR experience that’s far better than any of those cheapo headsets that use your smartphones as the brains and displays. Grab one now before they sell out!